Band will be: Nichol Robertson - guitar / banjo; Victor Bateman - upright bass; Tim Shia - drums; Chris Gale - tenor sax; Rebecca Hennessy - trumpet; Brodie West - alto sax & special guests on vocals. Subscribe! At CaMp CoMbO, we love keeping in touch through regular email. Get free CaMp CoMbO recordings. We keep your address secret and it's easy to unsubcribe. Promise! For your jollification, we perform kooky 20's/30's style jazz, older novelty and pop tunes, swell standards, wingy swing, schmaltzy waltzes, polkas and fun originals! Can jazz be be entertaining? Damn right! 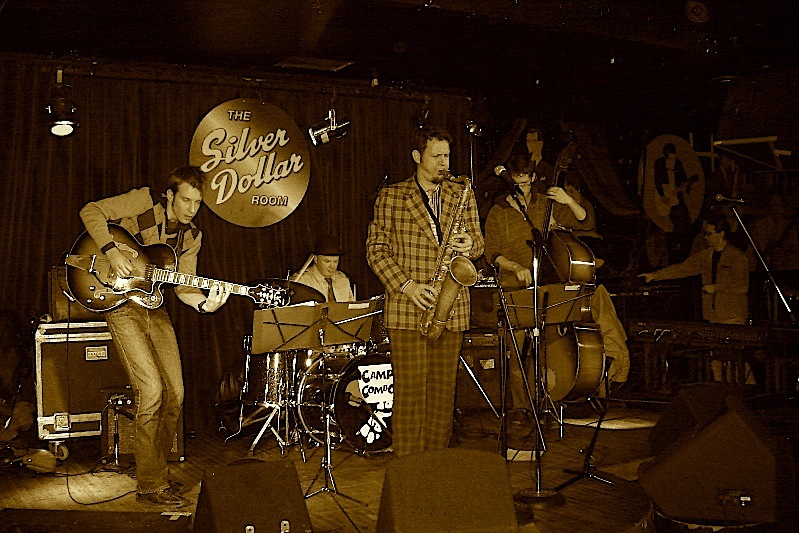 CaMp CoMbO joins a list of North American bands who've attempted to inject some arty fun into the jazzy side of popular music, including 1940-50s nutbar Spike Jones, Esquivel's crazy arrangements, Toronto's own Shuffle Demons and USA's Squirrel Nut Zippers. Toronto blogger Lonely Vagabond called us "hipster vaudeville", and it is a mix of pop/swing/jazz and polka. Plenty of original stuff, but we also sneak TV themes, surf beats, assorted swingers and maudlin ballads on to the set lists. So book us already! Music: Many choices! Scroll down for discs, most with music players. Also, our Bandcamp site (no relations!) is a good place to download music in various quality formats. An 11 song disc of oddball tunes the band loves to play. Original work by Fred Spek includes the song Hey Bev, which now has lyrics. Fred also wrote words for Tanya Cheex Polka and The Christians Are Boiling. Join our E-list and request free MP3s or order a CD. Fred will send it to ya, personally! Hear it now via the MP3 player below. ...and once you've installed it you'll have an audio player here instead of this message when you refresh your browser. 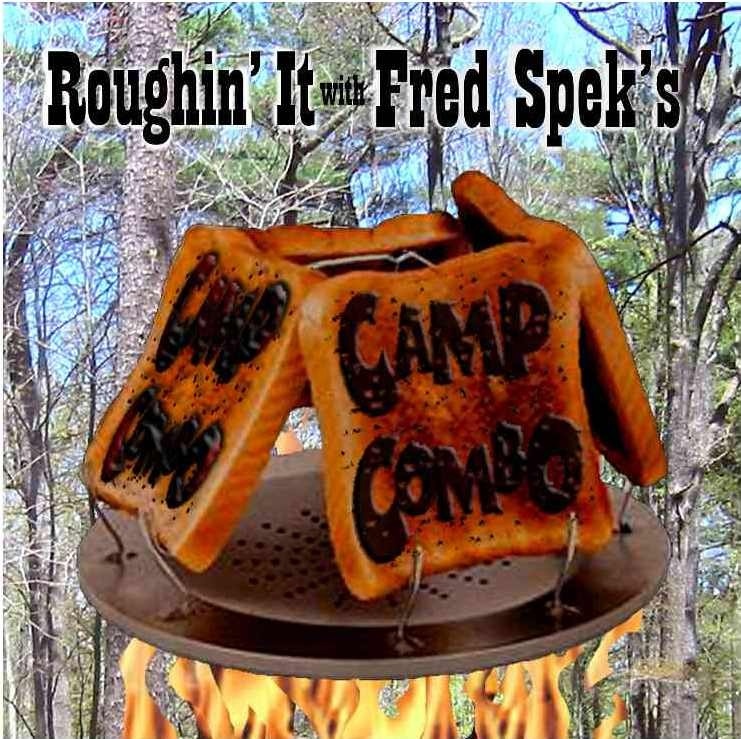 This recording is a 5 song EP of original tunes by Fred Spek. 2 are instrumentals, Fred sings on the others! Send your email address and ask for free MP3s or to order a CD. Hear it now via the MP3 player below. Tracks from the 4-song EP 'ROCK PAPER SCISSORS' can be heard with the MP3 player below. Our friend Brian Cram plays trumpet and Treasa Levasseur, accordion. Glen Hall of Exclaim! liked it, you can read his review below. Email me $10 and I'll send you a copy. Better yet, come to a gig and pick one up. We'll talk! We never talk. Streaming MP3s from the 7-song CD "Beans 'n Wieners" are below. Order the CD from CD Baby. Hear CaMp CoMbO versions of those old chestnuts "I'm Forever Blowing Bubbles" and "Happy Days Are Here Again". Wanna download our music? Get the audio quality level you want at Bandcamp (no affiliation to us other than a great name!). You could also go to iTunes and CD Baby. More stuff about us at the CBC's new-music page for Canadian talent! Head for the sky and find us on the Soundcloud, if that's where you hang. .
Also, Get our CDs (in Toronto) at Sonic Boom, Soundscapes on College St, Pandemonium (in The Junction) (a great vinyl selection there!). Torontoist - Urban Planner (Nov 13/12 The Reservoir Lounge) - Every night there’s a seemingly infinite amount of forgettable indie bands playing in bars across the city. Tonight, why don’t you try something a little different? 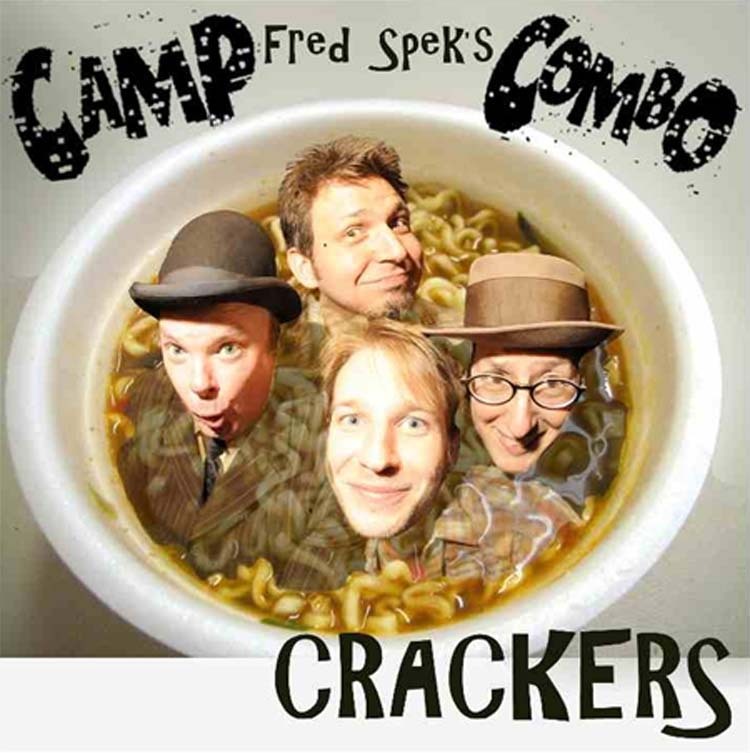 Fred Spek’s CaMp CoMbO promises a memorable evening, with their upbeat hybrid of pop, swing, jazz, and polka (lovingly known as “hipster vaudeville”). Don’t be surprised when a few TV theme songs and surf beats make their way onto the set list. "Fred Spek is a modern day Al Jolson-meets-Benny Goodman, part entertainer, part bandleader. The music is a bouncy carousel seamlessly blending jazz, swing, and ragtime. Offbeat characters capturing that sparkle of a Mardi Gras procession. A throwback, spattering of minstrelism and rousing musicianship, in the heart of Torontopia. A cuddly heart. With the spirit to match." Stanley Fefferman of The Live Music Report when Gary Topp booked us to open for T.O.F.U., "...and you would love to dig the opening band, Fred Spek's Neo Swing band Camp Combo playing tunes like the theme from "Secret Agent Man", and "Animal Crackers in My Soup". 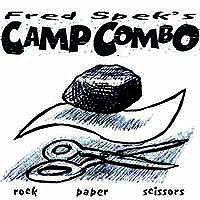 "The opening act, Fred Spek's Camp Combo, featured all of the elements essential for a novelty act: mad-paced, frenetic music that careened wildly between lounge and jazz, the all-important banjo and a singer sporting..." To read the rest, click here my friend. In 2008, Fred Spek did an interview and solo performance for Centennial College's The Journal, a student magazine style cable show. His bit is the last piece, so scroll to the end once it's loaded! Here's a video of the song Takes Two to Tango, from a gig at Mitzi's Sister on Toronto's Queen Street West. Thanks Cornelius Spek for posting this on Facebook in 2008. "...we went to Mitzi's Sister to enjoy Camp Combo. It was quirky music that featured raspy sax solos and some daring vocals from Fred Spek. One Safari-ite observed; "These guys are much better musicians than they are letting on!" while another said "It's nice to see these young boys having so much fun, they're really odd!" It was a memorable and wacky way to end our first Jazz Safari of the season. Fred would like to acknowledge support from the Ontario Arts Council, who awarded him a songwriters grant in 2011. Nichol S. Robertson was born and raised. He plays banjo, guitar and other people's feelings. Currently Nichol runs his own bands The Honkytonk Boogaloo Boys, The Layrite Boys duo, and also enjoys selling his soul to such musical acts as Friendly Rich & The Lollipop People, with Ted Hawkins in Thelonius Hank, Victor Bateman's Another Country, Devin Cuddy, Whitney Smith, Ian Goodhue's rockin' soul revue The Mercenaries, Stones cover band Dead Flowers, CCR cover band Locomotion and many others. In the future, he hopes to sell his soul to much more lucrative acts (i.e. Metallica, Lawrence Welk or the people who do the music for Saturday morning Christian channel shows). We've had so many fine and fun bass players with the band, see list below. Tim Shia, is often on the drum set, though we've had Great Bob Scott, Ted Hawkins and then some! See list below. Other Excellent Musicians that we've been lucky to work with are drummers Mike Rosenthal, who has done lots of gigs, and great recordings with us!, jazz cat Nick Fraser, GUH's Blake Howard, Daniel Barnes, Sly Juhas, Dave Clark, Lowell Whitty, Conny Nowe, Daniel Stadnicki, Joe Poole, Jake Oelrichs, Brodie West, Mark Westberg and Eric Bouchard. Bass players have included groovy Rachel Melas, JUNO winner Brandi Disterheft, living legend Victor Bateman, Brendan Davis, Wes Neal, Mike Herring, Brian Kobayakawa, Jon Meyer, Chris Banks and Mike Bann, and one special night Ka-Cheong Liu blew bass lines on his tuba! And last but not least, Micheal "Blitz" Kaler. Great guitarists such as Eric St. Larent, Rizaldo Padilla, Margaret Stowe, Jason Crawford and Tom Juhas have also played with the band. Trumpet blower Brian Cram, trombonists Scott Good and Steve Donald, alto Toby Hughes as well as bari saxist Ben Burke have all blown their horns with us, and whatta blast it was! We play nightclub dates, special events, swing dance parties, weddings, fundraisers in a variety of combos. We know many jazz standards. CaMp CoMbO has a Facebook page, but we prefer to keep in touch through email. Sign-up below!